Easy to add on additional units. Open construction allows for the use of cart covers when required. Industrial-type, hardened steel bearings allow loaded units to glide effortlessly over the track. 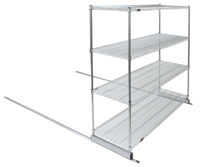 Wire Shelving (sold separately): Patented QuadTruss design makes shelves up to 25% stronger. Open-wire construction promotes higher visibility and reduces dust build-up. Posts are numbered in 1" increments for fast and level assembly. Each kit consists of a pair of aluminum tracks with end stops. All hardware and assembly instructions included. For tracks longer than 21", order multiple tracks. Example: for 30", use one 20" track and one 10" track. SDFT-10 10' single-deep floor track for floor-trak systems. SDFT-11 11' single-deep floor track for floor-trak systems. SDFT-12 12' single-deep floor track for floor-trak systems. SDFT-13 13' single-deep floor track for floor-trak systems. SDFT-14 14' single-deep floor track for floor-trak systems. SDFT-15 15' single-deep floor track for floor-trak systems. SDFT-16 16' single-deep floor track for floor-trak systems. SDFT-17 17' single-deep floor track for floor-trak systems. SDFT-18 18' single-deep floor track for floor-trak systems. SDFT-19 19' single-deep floor track for floor-trak systems. SDFT-20 20' single-deep floor track for floor-trak systems. SDFT-21 21' single-deep floor track for floor-trak systems. SDFT-22 22' single-deep floor track for floor-trak systems. SDFT-23 23' single-deep floor track for floor-trak systems. SDFT-24 24' single-deep floor track for floor-trak systems. SDFT-25 25' single-deep floor track for floor-trak systems. SDFT-26 26' single-deep floor track for floor-trak systems. SDFT-27 27' single-deep floor track for floor-trak systems. SDFT-28 28' single-deep floor track for floor-trak systems. SDFT-29 29' single-deep floor track for floor-trak systems. SDFT-30 30' single-deep floor track for floor-trak systems. SDFT-6 6' single-deep floor track for floor-trak systems. SDFT-7 7' single-deep floor track for floor-trak systems. SDFT-8 8' single-deep floor track for floor-trak systems. SDFT-9 9' single-deep floor track for floor-trak systems.